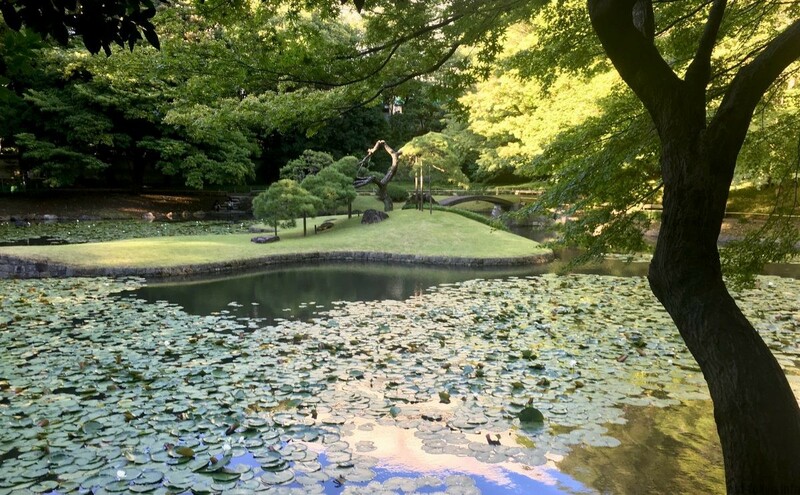 Koishikawa Korakuen garden is not only Tokyo’s oldest garden (established in 1629), it is also one of the rare remnants of an Edo mansion of a feudal lord. Of all the gardens in Tokyo, this is the garden vying with Rikugien for the top spot for its beauty. I have been passing by this garden very often, but never found the time to pay a visit. The huge Tokyo Dome next door made me worried that the garden would be completely overshadowed by this white spaceship-like monstrosity. That is indeed true, at quite a number of sights, but not all of them. 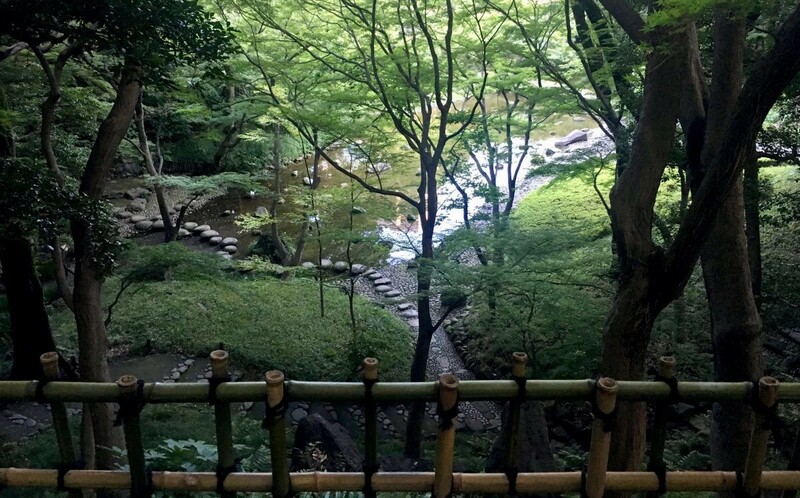 My main reason to visit this garden was its history as a Edo feudal lord mansion garden. As I wrote in my article on the red gate at Tokyo University, one of the things that is unique for Tokyo is its history as capital for over 400 years. The Edo policy of sankin-kōtai required each major feudal lord to reside regularly in the capital for a considerable amount of time, requiring him to build a residence worthy of his status in Edo, as well as in his own territory. Other such gardes are Kyū Shiba Rikyū Garden and Higo-Hosokawa Garden. 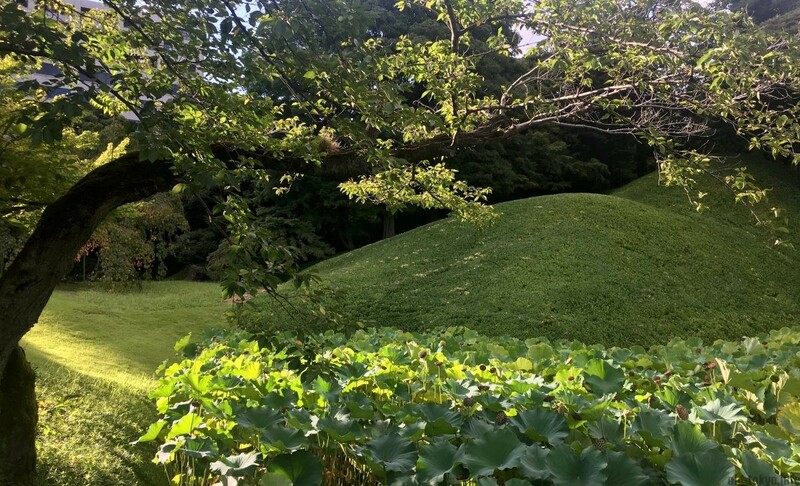 Artificial hill behind the lotus pond. The gentle slope imitates a view in China. This garden was established by the Mito Domain feudal lord (the domain currently associated with Ibaraki prefecture). This was actually Tokugawa Ieyasu’s 11th son Yorifusa (1603-1661), who was made daimyō (feudal lord) in 1608. The garden was then completed by Mitsukuni (1628–1701), who succeeded Yorifusa. He is also known as the Mito Kōmon, a legendary figure, made into a television drama between 1969 and 2011. 1,227 episodes were made! I am always a little confused when I see descriptions of Mito as branch of the Tokugawa clan (the ruling clan of the Shogun during the Edo Period 1603-1868). It actually just means they are family, not the same clan. The Mito Domain was quite like any other domain during that period, except that they of course kept the Tokugawa family name and hence had a special relationship with the ruling Tokugawa family. The Tokugawa’s had family in many other feudal lord families as they often married off their daughters to these feudal lords. Yorifusa and Mitsukuni are sometimes referred to in English with the Mito family name, but that is rare. The pond in the inner garden. Korakuen is a circuit-style garden with ponds and man-made hills. The garden was developed with advice from Zhu Shun Shui (1600-1682), a refugee scholar of the Ming Dynasty who also gave the garden its name. Korakuen is derived from a Chinese poem by Fan Zhongyan which means “garden for pleasure after”, signifying ”hardship now, pleasure later”. 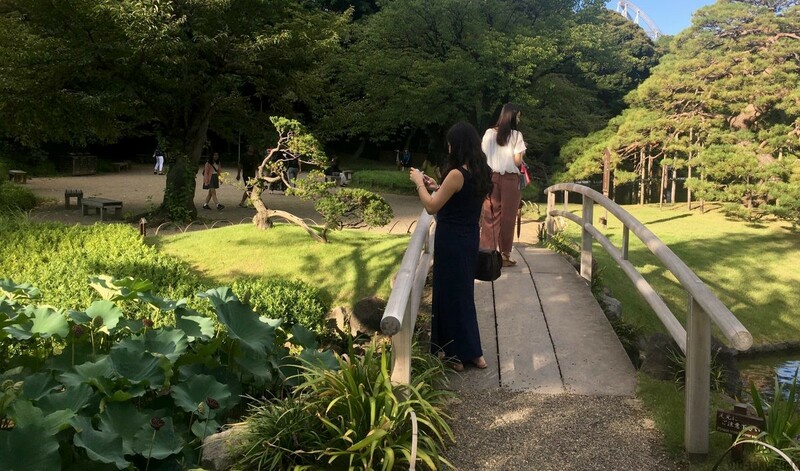 There is another garden in Japan called Korakuen, located in Okayama, that is actually more famous than this one in Tokyo. Due to this history this garden is not only designated in Japan as a Special Place of Scenic Beauty, but also as a Special Historic Site. At the same time it is a garden that was built out of appreciation of Chinese culture, I am not sure whether it is related, but the Japan-China Friendship Center is right around the corner. Daisensui: this is the large pond in the garden that represents Lake Biwa in Shiga prefecture. As it is close to Kyoto, Lake Biwa appears frequently in historical accounts and poems. Engetsu-kyō: full moon bridge, named after the shape when you combine its reflection in the water. Please note you cannot cross the bridge itself. Seiko-no-tsutsumi: a bank built to resemble Lake Xi Hu in Hangzhou. Tokujin-dō: Mitsukuni was “deeply moved” by the biographies of Boyi and Shuqi, two brothers who lived in China at the time of the transition between the Shang dynasty and the Zhou dynasty and are remembered in Chinese literary culture for their personal and moral virtue, loyalty, and pacifist idealism (read more on wikipedia). Hence, wooden figures of these 2 were enshrined in this small temple. This is likely the oldest building in the garden, built during the lifetime of Mitsukuni in the 17th century. Uchi-niwa: the inner garden that used to be separate from the main garden. It is right next to Tokyo Dome, that towers over this part of the garden. One of the scenic views. There are 67 so called miniature views imitating Japanese and Chinese scenic spots in the garden that are not explained in the pamphlet that you receive upon entering. There is usually a short explanation at the sight itself in Japanese, and sometimes a shortened version in English. These include the Atago-zaka from Tokyo (in the north) and Mount Lushan from China through soft green slopes. If you want the complete list, check the Japanese wiki page. Over time many elements were destroyed, as marked on the map as the “former site of”. In total I counted 6 of such former sites. I would expect that if all these buildings would have survived, the garden would have a larger appeal today. Other buildings are reconstructions, such as Kuhachi-ya, which was reconstructed in 1959. That little building is actually also quite interesting as it is not a teahouse, but a place to drink alcohol. The name of the building (Kuhachi-ya means nine-eight-building) refers to the precept to drink 90% of your capacity at noon, and 80% of your capacity at night. The bridge separating the large pond from the lotus pond. 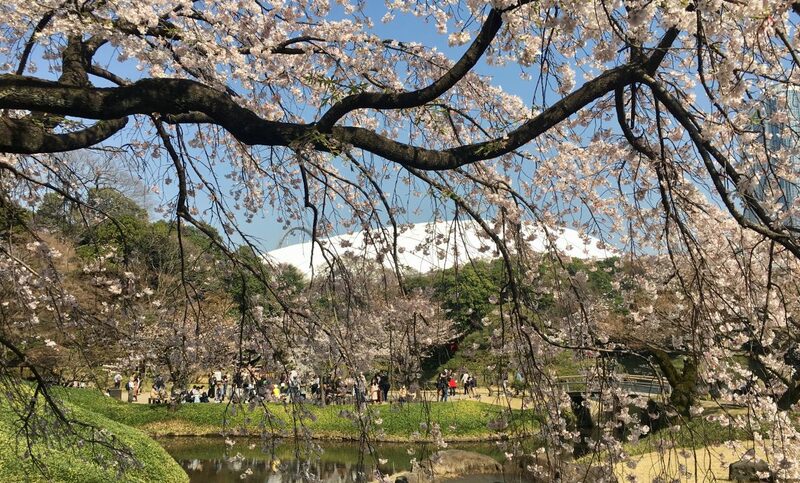 The garden is in particular famous for its plum trees as Mitsukuni apparently liked plum blossoms so much that he even used the Chinese character for plum in his pen name. 30 different types of plum trees bloom usually early February. The iris flowers (May-June) are also well known here. You can check the flower calendar on the official website. The area of the garden used to be 63 acres, but has been reduced over time to 17.5 acres (70,847.17 m2). It has been opened to the public in 1938. Please note you need at least one hour to get through the garden, I would recommend even two hours if you want to take a break here and there to take in the environment. Ironically, Korakuen station (Namboku Line, Marunouchi Line) is not the closest if you want to visit this garden. Of course, you can use that station as well.